9/15 SPCL Just remodeled, New Kitchen, Indoor outdoor tropical pool,Best rates ! Discover paradise at one of Destin's newest most luxurious property. This 8th floor oceanfront unit was completed remodeled in Jan of 2017, with a gorgeous new kitchen & new furniture as well. Majestic Sun offers amenities that are second to none. Indoor/outdoor pool with swim through wall, waterfalls from indoor pool to outdoor pool, fountains, dual hot tubs which face the ocean! On Site tiki bar, waverunner and parasailing! Bike rentals,kayak rentals. 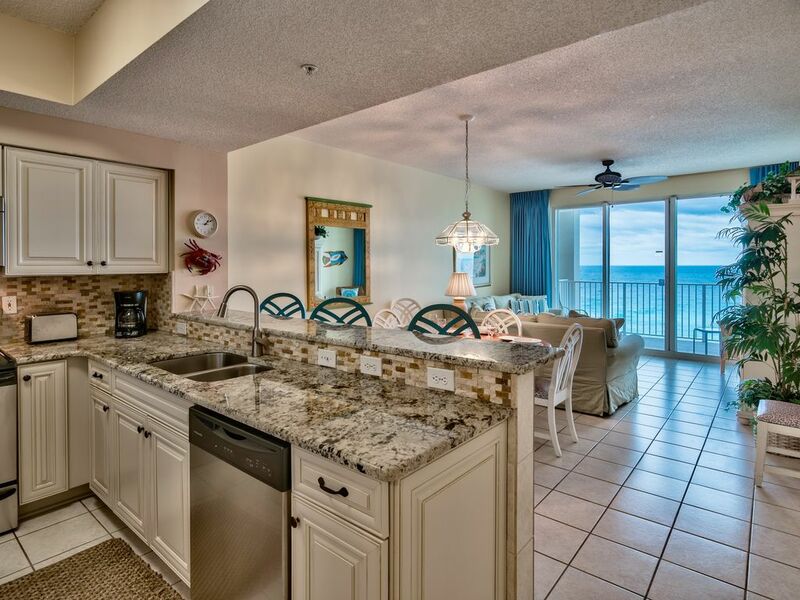 Our units 31437 & 451577 are done in a bright 'Beachey' decor with all the amenities of home. You can dolphin watch from your spacious private balcony or just kick back, relax, and watch the sun set! Voted, 'Best Family Resort'. Why Not!! it has everything you will want to have in a great family vacation spot. Indoor/Outdoor pool, two hot tubs,oceanfront fitness center, beachside tiki bar,perfect location,great restaurants within walking distance. Nicely equipped, all the amenities of home. This kitchen is brand new in 2017 with all new custom soft close cabinets, brazilian granite tops, all new stainless appliances. Great Stay at this property! Nice accommodations, clean with beautiful view, Family friendly, great Spring Break location! Property was great. The complex is huge. Parking was OK, elevators were fast, and the Amenities wonderful for a family vacation. The condo was clean and the view spectacular. We enjoyed our stay. The condo was very comfortable and well cared for. For the busy season, it did not seem overcrowded and the property facilities were excellent. The location was centralized among the best attractions and the owners were a pleasure to deal with. Thanks for the kind words. Majestic Sun has turned in to one of Destins Premier family resorts with amenities second to none. We look forward to having you back down to the beach. The property was great. Clean and very friendly staff. The best pool! We loved the condo. Everything we needed was provided and the view is amazing. Were so glad your family enjoyed the condo. This is Paradise to our family as well. Look forward to welcoming you back soon! We really enjoyed our stay at the Majestic Sun. The Burke's condo was very clean and up to date. The view from the condo was beautiful. We enjoyed seeing dolphins in the water. Easy access to the beach. I would recommend this condo. We would definately go back. The Burkes were good hosts, and we always enjoy staying at the Majestic Sun. or dolphin watching from your private balcony! some rates will be higher then posted for premium weeks or Holiday Weeks ! always call or text the Burkes before finalizing payments to be sure of the total amount which may include a service fee now.